And just like that…I am now an International MBA graduate of the Moore School of Business! April and May have been two of the busiest months of my life, completing my last semester of graduate school, preparing for graduation, searching for housing in Greenville, moving across the country, visiting family, and planning summer vacations before my next chapter begins at Michelin. Thank you so much for your patience in my time of transition – I can’t wait to be more active on inspirNational again once everything is settled this summer. Right now is one of my first moments in months where I have more than a half hour to spare as I am waiting for my trip to Seattle to begin. I have so many thoughts to share with you about my last few months, including my weekend trips to Savannah, Charleston, and Traverse City, my graduation, and my reflections as I prepare for my next life phase. Over the next several weeks, I will share these thoughts with you. To begin, I wanted to pass along my graduation speech that I shared at the MBA Soiree on the evening before my graduation. It captures the essence of my IMBA experience and was an honor to represent my class. “Hi Everyone! My name is Brittany VanderBeek. I am an International MBA graduate in the French track, who studied supply chain management and business analytics. As the MBA Student Association President, I wanted to share a few thoughts with you. First of all, thank you to MBA Programs Office for making today possible and for your endless support throughout our MBA journey. Thank you to the faculty and staff here today who have been there every step of the way – pushing us to reach our potential, growing our understanding of the world, supporting us when we need it most, and cheering us on during our successes. Thank you to all members of the Student Association for your enthusiasm and hard work to represent the voice of our class and to plan events to strengthen our MBA community. To our families and friends – thank you all for being here to celebrate the MBA graduates. We couldn’t be more grateful for your support throughout our lives. To the graduates – it is incredible to think how far we have come. Let’s take a minute to reflect. To the International MBAs – in two or three years we learned another language, completed the core business curriculum, specialized, and earned additional certifications. To the One-Year MBAs – how amazing that you completed all of your business curriculum and certifications in less than a year! At the same time, all of us were maintaining on our relationships and our homes, making new friends, getting involved on campus, going to football and basketball games, and staying in touch with loved ones. Some of us welcomed new life into the world, some of us have said goodbye to loved ones, but all of us have prepared for an incredible life ahead of us. We have had our fair share of challenges, but we have also had some of the most rewarding experiences of our lives. I can say that the Moore community, especially all of you, are what made my experience possible. As I mentioned at our welcome mixer, we have created a lifelong network and community. I hope that we all take what we have learned and soar in our careers throughout the world. I also hope that we never forget our roots at the Moore School and come back to visit. Reflecting upon graduation, it was one of the most hectic, but also exciting few days of my IMBA experience. I was very grateful for my mom, boyfriend, and boyfriend’s family who attended my ceremony and festivities. I was also grateful to attend my boyfriend’s graduation ceremony from law school, which was an incredible experience because we both graduated at the Horseshoe, one of the University of South Carolina’s idyllic locations. One day I was the graduate and the next day I was the attendee, which made my experience feel full circle. The University of South Carolina business and law schools treated us graduates and our families like gold, with delicious Southern food, cocktails, and live performers (I’ll never forget the steel drummers after my graduation!). I am so happy that I experienced graduation, but I am also glad that I can now move on and relax (or more so travel and visit family) this summer. I hope you all have an inspirNational weekend (and holiday weekend for those in the United States)! Off to Seattle for my boyfriend’s cousin’s wedding and to visit my best friend from preschool – I can only imagine what stories I will have to share with you over the next couple of weeks! It’s hard to believe that I have now lived in Greenville, South Carolina for 8 weeks. I have been busy adapting to my summer internship, meeting new friends, getting involved in the community, and traveling on weekends. People have often asked me, what is it like to live in Greenville? I wanted to capture a few of my favorite moments so far to explain the life of a Greenvillite. Imagine riding your mountain bike through 3 miles of bright green trees, parks, rivers, and wildlife guided by the perfectly paved Swamp Rabbit Trail, arriving to a modern downtown with dozens of tents selling fresh fruits and vegetables, local food, and gifts. Walking along Main Street full of tents, you sample homemade dips, smoothies, berries, and buy a mocha from a local coffee shop. You get persuaded to buy a half gallon of peaches, herbs to make herbal water, and cheese dips for your weekend party. This is a typical summer Saturday morning in Greenville and is one of my favorite ways to start the weekend. Imagine strolling through the immaculate Falls Park with the Reedy River and rocky waterfalls in sight from all angles. There’s a cool breeze under the trees and benches welcoming you to have a seat and read a good book. Or, if you’re feeling adventurous, you can read while sitting on the rocks right next to the waterfalls. Then walk around the longest suspension bridge in the country and enjoying lunch at the Passerelle French Bistro. French and other European cuisines are popular throughout the area because of the international businesses throughout Greenville, including Michelin, BMW, and GE. This is a typical summer Sunday in Greenville. I will never forget reading right next to the waterfall and will try to make it a new tradition for me. Imagine hiking the Blue Ridge Mountains at Table Rock State Park, with pathways matching every hiking skill level, and frequent opportunities for breathtaking views of the forests and mountains in the distance. You will experience steep paths, walk over bridges, in between boulders, and next to rivers and waterfalls. This is a typical after-work adventure that I happened to enjoy on the weekend. I am amazed to meet people of a variety of ages and fitness levels who hike at Table Rock State Park and many others in the Greenville area. These are three of my favorite nature-focused experiences, which are very much ingrained in the daily lives of Greenvillites. As a nature lover, summer in Greenville has been a wonderful opportunity for me to experience nature and stay active. I have also enjoyed going to my first minor league baseball game at Greenville Drive. Greenvillites have as much spirit for the Drive team as other cities have for major league teams! There’s nothing better than a hot dog, ice cold beer, and sunset to experience while watching the game. And if you go on a Thursday, you can get $1 beers, or on a Friday you can enjoy an impressive fireworks show after the game. Shopping and dining in Downtown Greenville is also incredible too. For a small city, it is amazing the diversity of the cuisine, representing almost all continents. The shopping scene is marked by local boutiques with artsy and stylish clothing, jewelry and gifts. Just writing about it is making me want to go shopping again soon. With nature, sports, shopping, and dining, Greenville can easily be described as active, family-centered, and a very pleasant place to live. I wasn’t surprised to learn that Greenville was recently rated North America’s City of the Future. I have had a wonderful experience so far and am grateful for the opportunity to live in Greenville this summer. I hope that those of you near the Carolinas will have the opportunity to visit Greenville! 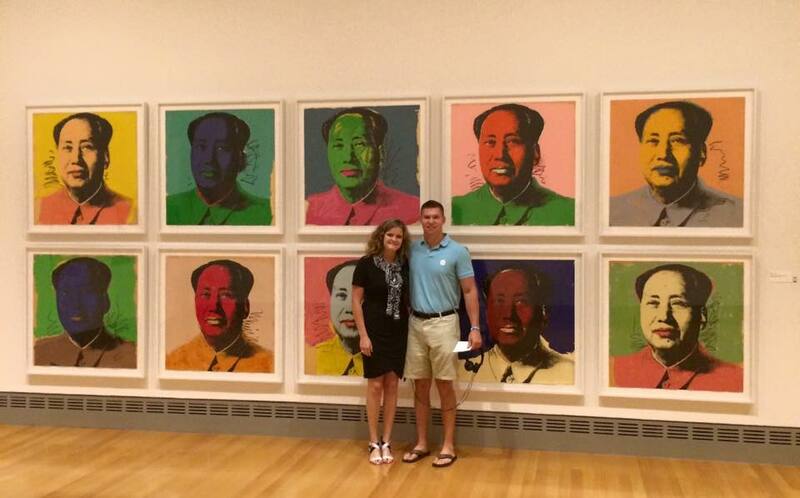 Recently I visited Andy Warhol’s exhibit, From Marilyn to Mao: Andy Warhol’s Famous Faces at the Columbia Museum of Art. 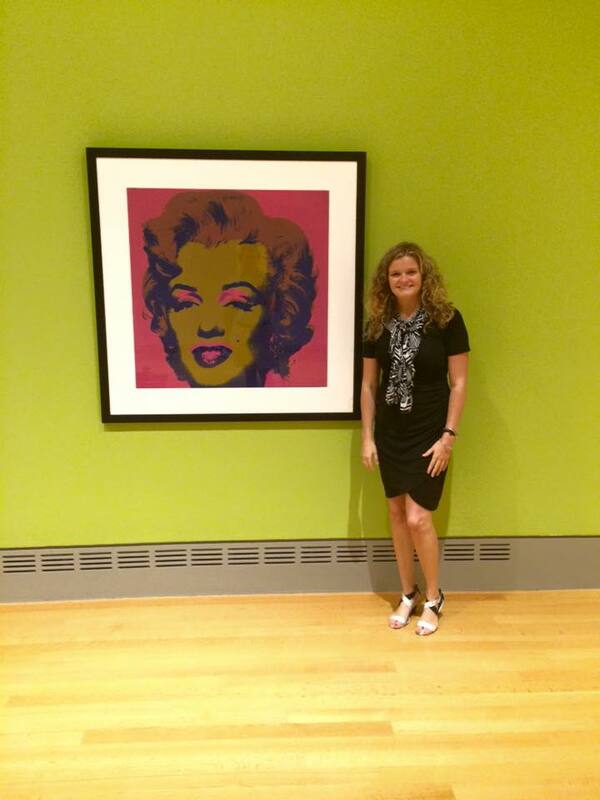 I had seen Andy Warhol’s art in books, but I had never understood the purpose or impact of his art. For those of you who are interested in art but struggle to understand its meaning, I encourage you to learn more about Andy Warhol’s art. He can relate to our fascination with fame and evoke emotion while we view his work. You can experience an interactive tour of the exhibit here. If you are in the Columbia, South Carolina area, be sure to visit the exhibit before September 13! 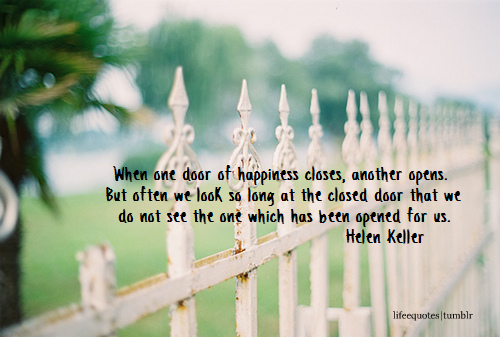 This month, my goal is to focus on the door that opens! I am very excited to embark on a new adventure to Columbia, South Carolina to earn my International MBA from the University of South Carolina. In the coming months, inspirNational will experience a French influence, as I will be studying French to add to my language and culture repertoire. In addition to living in South Carolina for the next two years, I will spend next January through April in Paris. I look forward to capturing inspirNational insights and sharing them with you as I enter this new life phase. Bon voyage!